PC/104 serial interface module that combines small size, industrial grade construction and reliability specifications, plus perform the functions most commonly need in embedded application. Because PC/104 modules use as smart stacking bus design, they avoid the costs and bulk associated with backplanes or card cage. 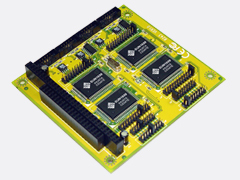 Multi-port PC/104 serial module equips with 2 or 4 ports high speed RS-422/485 standard serial ports. You can configure the I/O base address and interrupt vector of each serial port. Each serial port has built-in 64 byte hardware FIFO, and provides data transfer speed up to 921Kb/Sec with industry standard 16C750 asynchronous communication chip. Its work with PC/104 CPU boards that accept the PC/104 expansion interface, and comes with DB9 or DB25 connection cables are available as options to meet users' varied connection requirements.